It is always really good to go back and train with my main instructor, Kev Capel at RGA Buckinghamshire. That's something I will be doing much more regularly from now on, although still not exactly frequent as it will be once every month or two. Having a long-distance relationship to your instructor can be difficult, but if the calibre of the instructor is high enough (as it is with Kev, who has the integrity to match his teaching skill), it's well worth the extra effort. 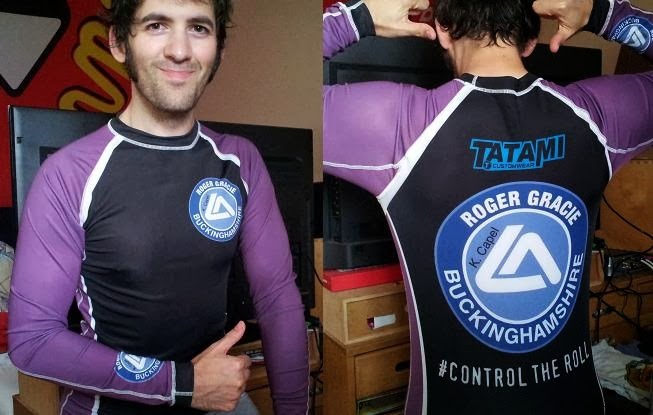 As I mentioned in my previous post, Kev's partner Yaz was promoted to black belt on Wednesday, making her the first female black belt under Roger Gracie and the fourth female black belt in the UK. The occasion for that grading was the official opening of Kev's new academy, a short walk from the previous location but a considerable step-up in terms of its facilities. My sense of direction is notoriously terrible and I'm also poor at reading maps (I got a bit confused by the Google Maps location). I therefore relied upon staring at my phone's SatNav, which eventually got me to the right place. The route I took was to walk up onto the bridge outside the entrance of Aylesbury train station: from there, I could see the RGA Bucks sign on the side of a building. Walk to the end of the bridge, then turn left. Go across the small bridge that has the 'cyclists dismount' sign on it. You'll soon see the entrance to RGA Bucks on the right, with a metal fence around it. Saturday training begins with an hour and a half class, followed by open mat for drilling and sparring. Kev opened up the sessions with a single leg takedown, with two closely related variations. Block their hands from grip fighting by literally covering them with your own hands, then establish a cross-grip on their collar (i.e., grabbing the opposite side to your hand). In a comparable motion to the collar drag from butterfly Dónal showed on Thursday, pull their collar down and past you. At the same time, slide your leg (same side as the collar-gripping arm) between theirs, wrapping around their lower leg. Be sure to bring your head to the outside of their leg, staying tight, or they can stuff your head. From here, stand up, lifting their leg and trapping it between yours as you do (the motion is basically a technical stand up, posting with the hand that was gripping the collar). Switch so that your arm is under their leg rather than your leg (you can bump their leg up with your knee to facilitate that transfer). Bring your other hand around their same side hip, stepping sideways and staying close. That's in order to thrust your hip forwards to knock them sufficiently off balance that you can then lift them up and drop them. This isn't a strength move, so if you're having to use a lot of force, adjust your grips and your hip bump position. The second variation is a small change, which is to keep hold of that collar grip when standing up, rather than posting on your hand. That means you can still do a technical stand-up, but also shove them away with the collar grip. As you step up, that gives you some additional leverage, which may enable you to knock them to the ground, putting you in a good position to pass the guard. You're on the side of their turtle, maintaining pressure. Open up your gi, pulling out the end of the lapel, then shove that down past the far side of their neck. Pass it under their body, so that your hand nearest their hip can grab it (be careful you aren't reaching too deep into their turtle, as they might be able to trap your arm and roll you over). Step your foot up to the far side of their body, angling it outwards. Bring that leg over their shoulder, right by the gi lapel you've pull through, then drop back. Swing your other leg over them too, then use the combined leverage of your legs, arms and collar grip to apply the choke. It should be a blood choke rather than a crank or air choke, so adjust if you're having problems. A key point is not dropping off their head: stay tight with your leg so they cannot pop their head free. The nogi variation is done with your arms. Rather than the gi lapel, put your arm (nearest their head) to the far side of the neck, just far enough that the blade of your arm is cutting into their neck. Just like with the lapel, reach your other hand underneath from the near side, linking up your hands. From there, it is exactly the same as before, just using your arms instead of the gi for the application. I kicked off sparring with my training partner, Sandeep. I was being lazy and went straight into the running man escape when he managed to get on top. We then spent almost the entire roll fighting for a few millimetres, in my case attempting to shove his hand back past my knee and avoid his other arm from creeping around my neck. Eventually, Sandeep was able to get a grip under both my elbows, using that to slide into mount. That hasn't happened to me before, so I'll have to watch out for it. He didn't have a chance to finish from there, as the buzzer went shortly afterwards. I then had a roll with Kev, who naturally dominated me quite easily, but also gave me some room to work. It was almost exactly the same roll as I had with my other instructor Dónal: lots of defensive scrambling on my part, trying to spin and twist out of submissions when I could feel Kev starting to lock something on. He finally caught me in an armbar, which I tried to hitchhiker escape out of, but he had a figure-four grip, closing that particular door. After sparring, I stayed for a bit of drilling during the open mat. Sandeep gave me some awesome advice about a few more chokes from side control, fitting perfectly with my game. I've got several useful chokes for side control now, building on Dónal's private lesson and the two I used prior to that (step-over triangle and the lapel choke). Sandeep's first option was to get the arm nearest their head over to the far side. Reach back, in a sort-of guillotine grip under their neck, grabbing your own leg. Block their near hip with your other arm, then start to move your head over to the near side as well (as you would with that lapel choke I like). If you need some extra leverage to finish, squeeze your arm. This should fit well with that half guard grip I frequently get behind the head, though I'd need to free my leg to finish the choke. Be sure to get your knee right onto their neck, then cross your ankles to lock your feet. Curl your toes back for additional pressure, like you would with a triangle. To get the submission, stretch your legs and squeeze. The tap is very quick, though it just pressure on the windpipe rather than a blood choke. Still, definitely an effective attack.